Leadership Georgia is regarded as one of the nation’s oldest and most successful leadership training programs. Their alumni are quite impressive including leaders in business, non-profits, and elected officials that are all working together for a better Georgia. This year’s cohort was no different with over a hundred professionals that have all distinguished themselves in their respective fields. The programming for Leadership Georgia includes visits to five communities to learn more about regions of the state and respective opportunities in each. Albany, GA was on the agenda for this year and the first part of the trip focused on highlighting the positive impact quail hunting has on South Georgia. 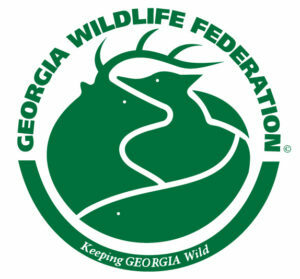 The organizers wanted to provide a more hands-on curriculum for this portion of the program and approached the Georgia Wildlife Federation about putting together a shotgun-shooting experience for participants that were interested in giving it a shot. Thankfully, through support from the National Shooting Sports Foundation and Georgia Department of Natural Resources, we were able to bring this request to fruition. 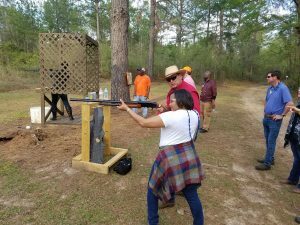 On March 14th the Leadership Georgia group met at Wynfield Plantation and about 80 participants indicated they wanted to try shooting. They were asked to raise their hands if they had never used a firearm before, the majority of the participants’ hands shot up and after a safety briefing and some directions, we were on a mission to change that. The class divided into groups of five and dispersed to the different sporting clays stations. Sporting clays was the perfect activity to stick with the quail theme because the targets are displayed in a manner to mimic hunting situations as you move through the course. At each station we coached participants through the entire process from mounting the shotgun, positioning their body, to executing the shot. Every time a participant was able to break a clay cheering erupted from the group. From all of the smiles, laughing, and light-hearted bragging, it was evident that everyone had a great time. We received substantial positive feedback from the participants with a fair number of the first-time shooters even reporting that they plan to buy a shotgun. We were honored to get to help the 2019 class of Leadership Georgia kick off their Albany visit with a bang and look forward to other opportunities to get people outside shooting, hunting, or just enjoying nature. About the Author: Parker Gerdes is currently working on his bachelor’s degree in Natural Resource Management with a concentration on Conservation Law Enforcement at Abraham Baldwin Agricultural College (ABAC) and works for the Georgia Wildlife Federation. As the Campus R3 Coordinator for ABAC, Parker is creating programs to introduce students to hunting and the shooting sports that have never had the opportunity to participate. His position is supported by the National Shooting Sports Foundation.